Read all about the new technology that is winning races right now. The information found in this book is being used to win with CUP style cars, touring late models, modifieds, stock clip car, mini cars, road race cars, asphalt and dirt cars. Trial and error has become a thing of the past. Get with the program, save time and money by getting the right setup. 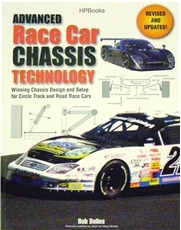 This 176 page book has the information to setup and maintain a winning race car. It includes pictures, illustrations and calculations to put you in the winners circle.